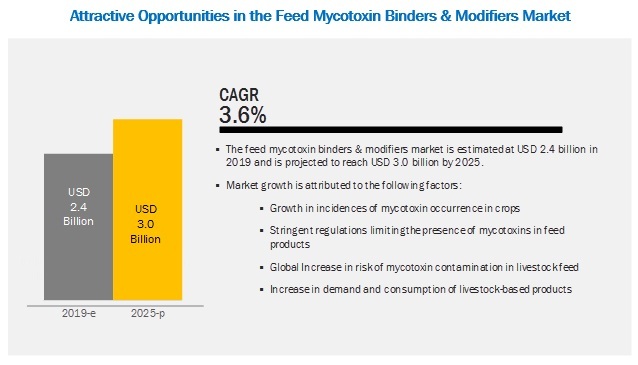 [181 Pages Report] The feed mycotoxin binders & modifiers market is projected to grow from USD 2.4 billion in 2018 to USD 3.0 billion by 2025, at a CAGR of 3.6% during the forecast period. This is attributed to the increasing demand and consumption of livestock based products, rising incidences of mycotoxin occurrence in crops, stringent regulations limiting the presence of mycotoxin in feed products, and global increase in risk of mycotoxin contamination in livestock feed are some of the major drivers for the growth of the feed mycotoxin binders & modifiers market. The mycotoxin binders segment dominated over feed mycotoxin modifiers in the market in 2018. In mycotoxin binders segment, clay dominated among all the subtypes of mycotoxin binders, whereas yeast dominated among all the subtypes of mycotoxin modifiers. Mycotoxin binders are used widely as they are cheaper and are commercialized on a large scale, making them comparatively easy to procure. Furthermore, these have a longer shelf life and does not get affected by different climatic conditions, making them safe for use in all climatic conditions. The swine segment is projected to be the fastest growing segment during the forecasted period. young pigs and breeding swine are most susceptible to mycotoxin contamination. Thus, the prevention of mycotoxins needs to be ensured in the swine to reduce the negative effects of mycotoxin on swine health and performance. This drives the use of mycotoxin binders & modifiers in the swine segment. On the basis of source in the feed mycotoxin binders & modifiers market, the inorganic source holds a larger market share in 2018. Feed mycotoxin binders are mostly obtained from inorganic sources such as silicates of aluminum, sodium, potassium, and calcium. Clay products including bentonite, zeolite, montmorillonites, and HSCAS (hydrated sodium calcium aluminosilicate), activated charcoal, and synthetic polymers such as polyvinylpyrrolidone and cholestyramine are used in the feed industry to bind aflatoxins. These products have numerous benefits when compared to organic modifiers such as lower prices and ease of storage & handling, which has resulted in an increased preference for these products over organic mycotoxin modifiers. The North America is projected to account for the largest market share in the feed mycotoxin binders & modifiers market during the forecast period. The North American market accounted for the largest share in the feed mycotoxin binders & modifiers market. This dominance is attributed to the increase in mycotoxin risk level in livestock feed and the adoption rate of mycotoxin binders & modifiers in livestock feed in this region is high as compared to other regions. According to the BIOMIN World Mycotoxin Survey, 2018, it has been stated that the risk associated with mycotoxin in North America was 73%, whereas in 2016 the risk was 66% for the same. Furthermore, the stringent regulatory framework in these countries for mycotoxin threshold level has also resulted in an increased demand for mycotoxin binders & modifiers. The major vendors in the global feed mycotoxin binders & modifiers market are Cargill (US), BASF (Germany), ADM (US), Bayer (Germany), Perstorp (Sweden), Chr. Hansen (Denmark), Kemin (US), Nutreco (Netherlands), Adisseo (France), Alltech (US), Novus International (US), BIOMIN (Austria), Impextraco (Belgium), Norel (Spain), and GLOBAL NUTRITECH (Turkey). These players have broad industry coverage and strong operational and financial strength; they have grown organically and inorganically in the recent past. January 2019, ADM acquired Probiotics International Limited (UK), under its brand Protexin. Protexin would offer a variety of natural products and probiotic supplements for the veterinary, agriculture, and equine healthcare markets. This would increase the product portfolio of the ADM nutrition division. In December 2018, BioVet, S.A (Spain), subsidiary of Provimi launched its product Alquerfeed Antitox in India to target the Indian market. Alquerfeed Antitox is a product based on Silicoglycidol that adsorbs mycotoxin. In November 2018, Alltech strengthened its presence in Asia by opening a sales office in Nepal. This would help the company to reach more customers. September 2018, BIOMIN launched mycotoxin detection service that would allow the identification of more than 50 mycotoxins and metabolites in feed and raw material and treat it with their mycotoxin feed additive, Mycofix. February 2018, Adisseo acquired global feed additives producer Nutriad (Belgium). This transaction was part of Adisseo’s strategy to become one of the worldwide leaders of specialty additives in animal nutrition. Who are the major market players in the feed mycotoxin binders & modifiers market? What are the regional growth trends and the largest revenue-generating regions for the feed mycotoxin binders & modifiers market? 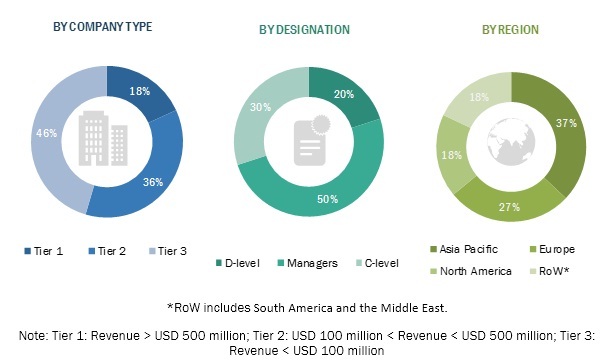 Which are the major regions for different industries that are projected to witness a significant growth for the feed mycotoxin binders & modifiers market? What are the major types of feed mycotoxin binders & modifiers that are projected to gain maximum market revenue and share during the forecast period? Which is the major type of livestock where feed mycotoxin binders & modifiers are used that will be accounting for majority of the revenue over the forecast period? The study involved four major activities in estimating the current market size for the feed mycotoxin binders & modifiers market. Exhaustive secondary research was done to collect information on the market as well as the parent market. The next step was to validate these findings, assumptions, and sizing with industry experts across the value chain through primary research. Both the top-down and bottom-up approaches were employed to estimate the complete market size. Thereafter, market breakdown and data triangulation were used to estimate the market size of segments and subsegments. In the secondary research process, various sources were referred to, so as to identify and collect information for this study. These secondary sources included reports from the Food and Agriculture Organization (FAO), United States Department of Agriculture (USDA), European Food Safety Authority (EFSA), International Feed Industry Federation (IFIF), The Compound Feed Manufacturers Association (CLFMA), Animal Feed Manufacturers Association (AFMA), and Organisation for Economic Co-operation and Development (OECD), which were referred to identify and collect information for this study. The secondary sources also included annual reports, press releases, investor presentations of companies, white papers, certified publications, articles by recognized authors and regulatory bodies, trade directories, and databases. The overall feed mycotoxin binders & modifiers market comprises several stakeholders in the supply chain, which include raw material suppliers and manufacturers. Various primary sources from both the supply and demand sides of the market were interviewed to obtain qualitative and quantitative information. The primary interviewees from the demand side include animal husbandry companies, large-scale ranches, poultry farms, and researchers. The primary sources from the supply side include producers of feed mycotoxin binders & modifiers, suppliers, distributors, importers, and exporters. The feed mycotoxin binders & modifiers market size, in terms of value, were determined through primary and secondary research. After arriving at the overall market size from the estimation process explained above, the total market was split into several segments and subsegments. In order to estimate the overall feed mycotoxin binders & modifiers market and arrive at the exact statistics for all segments and subsegments, the data triangulation and market breakdown procedures were employed wherever applicable. The data was triangulated by studying various factors and trends from the demand and supply sides. Along with this, the market size was validated using both the top-down and bottom-up approaches. This research report categorizes the feed mycotoxin binders & modifiers market based on type, livestock, source, form, and region.